Keep Your Powder And Your iPod® Dry! If there were two favorite gadgets loved by product designers this past two years, it was the USB port and the iPod. Don't get me wrong, I love my port (preferably not too sweet) and don't remember life without my iPod, but jeez, do I really need a farting plastic dog or a bookcase holder for my iPod? This time, I've fallen for an iPod gadget though. If you enjoy exercise in the cold and snow, you'll like it too. It's a pair of ski gloves with a joy stick on the outside so you can operate your iPod without having to remove your gloves. It's so easy to use, you don't have to stop mid-ski or mid-walk to fast forward to a new track. The gloves are no slouch either; otherwise why bother with the iPod joy stick? The gloves are fully insulated, have a moisture proof lining, pigskin fingertips, and an abrasion-resistant nylon shell. The elastic cinch cords keep out the snow and ice. 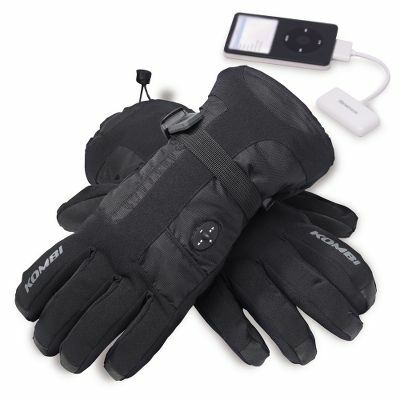 The iPod® Controlling Ski Gloves are compatible with 4th and 5th generation iPod, 1st and 2nd generation Nano, and iPod Mini. From Hammacher Schlemmer, where you get a lifetime guarantee. Sit On It Or Hang It Up, My Deer!